Helen L. Miedema-Peterson, 88, of Janesville, Wis., and formerly of Clinton, Wis., died Tuesday, June 14, 2016 in her daughter’s home surrounded by her family. She was born May 26, 1928 in Streator, Ill., the daughter of Cecil and Goldie Martha (Scurlock) Shull. Helen attended Clinton High School class of 1946. She married Jacob Miedema on Feb. 14, 1946 in Clinton, Wis. He predeceased her on Feb. 20, 2000. She later married Gerald L. Peterson on Jan. 6, 2001 in Jefferson Prairie Lutheran Church. He predeceased her on April 17, 2013. Helen worked at Beloit State Bank for 30 years, retiring in 1979. She was the first woman Branch Manager in all of Rock County. Helen was the co-owner of Classic Department Store in Clinton, Wis.
She was a very active in the Clinton Community and Jefferson Prairie Lutheran Church where she was the treasurer of the Women’s Circle for many years, treasurer of ALCW and treasurer of ALCW Southern Wisconsin District, treasurer of the Historical Society from 1991-1999 and a member of the DAR Regent. Survivors include her children, Joyce (Thomas) Halvorsen of Leesburg, Fla., Sandra Mutchler of Janesville, Wis., Nancy (James) Thompson of Brodhead, Wis., and Robin (Bill) McMullin of Janesville, Wis.; grandchildren, Dan (Diana) Mutchler of Calif., Teri (Michael) Schafer of Minn., Debra (James) Hogue of Wis., Seth (Melanie) Thompson of MI; Samuel (Kym) Thompson of CO, Rachel Thompson of Ind., Stuart McMullin of Wis., Karina (Ian) McQuistan of Minn., Jenica Boorom of Wis., Ethan (Tristin Lewis) Boorom of Colo., and Stasia (Bryce) Hummel of Wy. ; 21 great grandchildren; three great-great grandchildren; Jerry’s children and grandchildren who knew her as Grandma Helen; many nieces, nephews, cousins and friends including life long friends, George and Elaine London. She was predeceased by her parents, siblings, Virginia (Mel) Tracy, Louis “Bud” (Gladys) Shull and Marion Shull; son-in-law, James Mutchler, granddaughter-in-law, Melissa Thompson, all her brothers-in-law and sisters-in-law. Funeral service for Helen was at 3 p.m. Sunday, June 19, in Jefferson Prairie Lutheran Church 23184 Bergen Road, Poplar Grove, Ill., with Reverend Thomas Groth officiating. Burial followed in Clinton Cemetery, Clinton, Wis.
Visitation was from 2 p.m. until the time of service Sunday in the church. 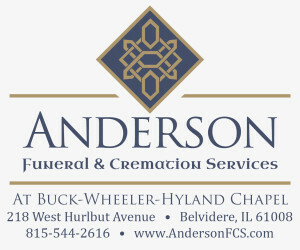 Daley Murphy Wisch & Associates Funeral Home and Crematorium, 2355 Cranston Road, Beloit, Wis., assisted the family with arrangements. Memorials may be given in her name to Jefferson Prairie Lutheran Church or Agrace Hospice.